The bear statue, "The Pondering Grizzly" is one of the well known "Bears on Broadway" statues and is on display outside City Hall in the City of Winnipeg, Manitoba. On National Aboriginal Day in the City of Winnipeg, a yearly celebration since 1996, a tepee also decorates the front lawn outside City Hall. Sculpted by Peter Sawatzky, this statue was transformed from a polar bear into a pondering grizzly and the artist, Clarence Tillenius used unique coloring to make this statue appear life like. Tillenius is known as one of the finest wildlife painters in Canada along with his other talents of being an explorer, lecturer, teacher, photographer and writer. Picture of the Pondering Grizzly Bear statue displayed outside City Hall in the City of Winnipeg, Manitoba in Canada. ... After a fundraising project, Cancer Care Manitoba in 2005, this bear statue was permanently relocated to City Hall. Many tourists to the City of Winnipeg in Manitoba, stop to have their picture taken with "The Pondering Grizzly". 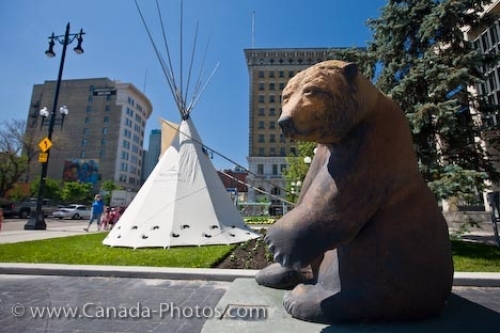 Teepee and a bear statue titled "The Pondering Grizzly" by Clarence Tillenius (part of the Bears on Broadway collection) outside the City Hall, City of Winnipeg, Manitoba, Canada.